SEMI-FINAL PLACE BECKONS: Conor Murray celebrates his try against France on Sunday and the injury-hit Ireland team face Argentina on Sunday (1pm) as they seek a last four spot. The biggest sporting event bar none this weekend is the Ireland v Argentina at the Millennium Stadium on Sunday. 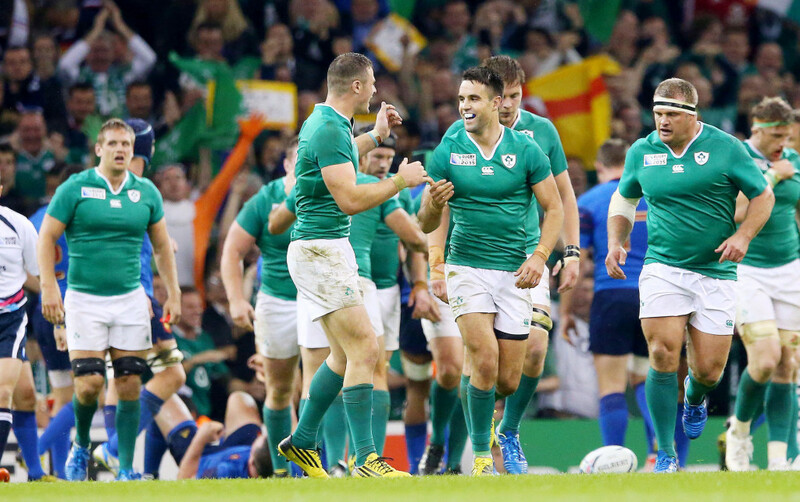 Ireland won all 4 group games including that bruising encounter against a strong France team on Sunday. They will be missing their inspirational and now retired captain Paul O’Connell, Peter O’Mahoney, possibly Jonny Sexton and my man of the match on Sunday, Sean O’Brien who got a week’s ban for that punch on Pascal Pape. This Ireland (1/1) team have strength in depth and we expect them to give the Pumas a five point in the handicap and still beat them and book an historic semi-final against Australia or Scotland next Sunday, 25th October. All eyes will on that game on Sunday especially if Ireland can win and we think Australia (10/11) can give Scotland a 15 point lead and still beat them. On Saturday, we think New Zealand (10/11) can give France a 12 point start and book their semi-final place against South Africa (10/11) who get the nod over a hard-to-beat Wales team and this is the Springboks giving them an eight point start in the handicap. Thank the Lord those internaional qualifiers are over and it’s back to bread and butter this weekend. We start at White Hart Lane where Spurs tackle Liverpool and we are banking on Jurgen Klopp taking a point in his first game in Saturday’s early kick-off. Sticking with the lunch-time kick-offs and Hull can take a point on their travels when they visit Hillsborough to tackle Sheffield Wednesday. Hopefully a few pound banked as we head into the last selection and we head to Goodison Park and are taking Man Utd to take a point away at Everton in what looks a tight game. Remember the draw treble pays around 35/1 – any two in the trixie will pay around 11/1 and come Saturday night that might be welcome. All our goalrush games are on Saturday and we suggest both teams to score in the following games: MK Dons v Blackburn, Leeds v Brighton, Preston v Cardiff, Doncaster v Bradford, Crewe v Gillingham and finishing with the Port Vale v Peterborough game. Right, onto the weekend quad and again all Saturday games and we start in the Premier League, taking Crystal Palace (1/1) to continue their solid start to the season with a win at home to West Ham. West Brom (1/1) need a win on the board quick and we think they can grab all points against Sunderland who have Sam Allardyce at the helm for the first time. If Wigan (1/1) want to be serious title contenders in League 1 they will have to start putting wins on the board and we think they can take all the points against Colchester on Saturday. We head to League 2 to make the weekend quad up and we are banking on Leyton Orient (13/10) bouncing back from defeat at Crawley and taking all points at home to third-placed Oxford. Finally on to the weekend bankers bet and we head to the Premier League to start our odds-on weekend bet and taking win for Southampton (4/5) who entertain Leicester while Arsenal (1/2) can win at Watford. Into the Championship and Burnley (4/5) can see off Wigan while Ipswich (5/6) can get back on track with a win over Huddersfield. Coventry (4/7) make the weekend bankers bet up when they entertain lowly Blackpool – the bankers pays a handsome 14/1. We are online everyday via our Facebook/Twitter feeds and will be giving away Punter Packs to the massive Down Royal meeting at the end of the month. Also free bets from Sean Graham on a daily basis along with betting banter and bets of the week so seek us out folks. It’s ‘Champions Day’ at Ascot this weekend and what a cracking six-race card we have in store on Saturday and we start with the big race on Saturday and the Champion Stakes (3.05pm) and Irish Derby winner Jack Hobbs (11/8) looks the one they have to beat come the weekend. The John Gosden trained horse has been laid out for this race and will take some stopping with the each-way danger being Racing History (14/1) who was a late addition to the field after Saeed bin Suroor and Godolphin stomped up a supplement cost of £75,000 and he may grab a place. On to the Group One Queen Elizabeth II Stakes (2.30pm) and the mighty Solow (11/8) won the Queen Anne Stakes here will be the one they all have beat come Saturday but there will be dangers and Kodi Bear (8/1) could relish the conditions and run him close while one time Derby favourite Elm Park (20/1) could be the each-way punt in the race. The day starts with the Qipco British Champions Long Distance Cup and Clever Cookie (6/1) could be a big player in this and returns after a well-earned rest with the danger coming from Doncaster Cup winner Pallasator who is around 5s as well. On to the British Champions Sprint Stakes (1.20pm) and sprinter of the year Muhaarar (2/1) will take all the beating but keep an eye out for The Tin Man (10/1) who hosed up over course and distance last month and has been supplemented for the race at the cost of £40,000 – take the hint on this big each-way player. On to the Fillies & Mares Stakes (1.55pm) race and if Longchamp heroine Covert Love (9/2) turns up then take note about this improving mare might just see them off from the front with French horse Candarliya (8/1) the big danger. On to the final race of the day, the Balmoral Handicap (3.45pm) and we suggest you get on course and distance winner Buckstay at 10/1.